Well, of course Wesley Snipes would say that there’s always a possibility he’ll be Blade again, and that there have been conversations. Just like when I met Sam J. Jones at Comic-Con, he said there were conversations about Universal doing a sequel to 1980’s Flash Gordon, starring him. Or how this one guy named Doug whom I keep running into in Hollywood thinks his Christopher Lee impersonation is going to make him a star voice in the next Pixar film, despite the fact that he lives in a storage unit and smells like an alleyway. Snipes has an incentive to keep the conversation going about the one major role of his people still like talking about – it means we’re talking about him. Marvel, however, has no incentive to bring him back. 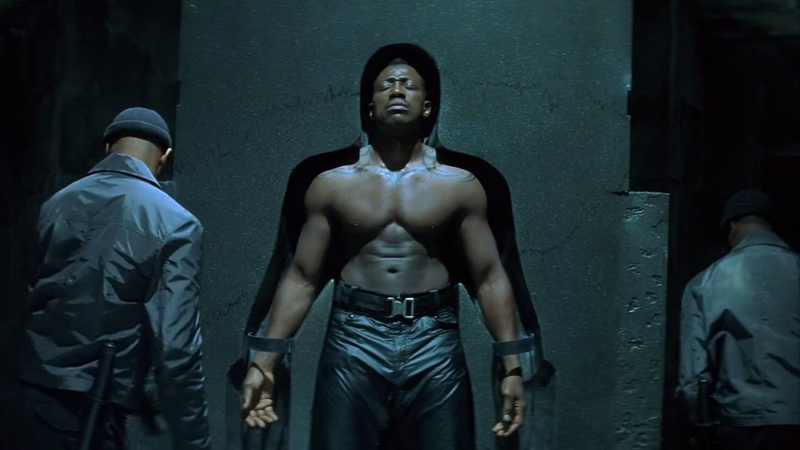 Marvel also hasn’t likely forgotten Blade III, during the shooting of which Snipes and director David Goyer almost came to blows, and which specifically gave Blade two younger sidekicks who could theoretically continue the franchise without Snipes. There’s a reason Snipes stars in mostly direct-to-video stuff now, and it isn’t his prison time – it’s that people don’t want to work with him. Like his fellow former superhero Val Kilmer, he has been labeled difficult, fairly or not. There’s yet another factor, which is that now that Marvel can call their own shots, they like to present the character in ways truer to the comic-book origins. So, show of hands – how many of you knew that Blade was originally English? Marvel could probably get, say, David Oyelowo. There’s no reason they have to settle for Snipes.